The pictures of Spitalfields taken by C A Mathew in 1912 have inspired such curiosity that I invited Vicky Stewart to research into the photographer’s life and today she reveals what she found. 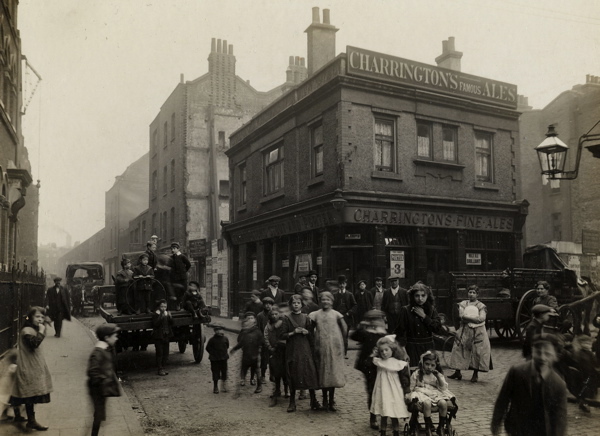 I had risen to the Gentle Author’s challenge of finding out more about C A Mathew, the photographer who took an extraordinary series of pictures, capturing the street life in Spitalfields on Saturday 20th April 1912. This is what I discovered and here is my story. 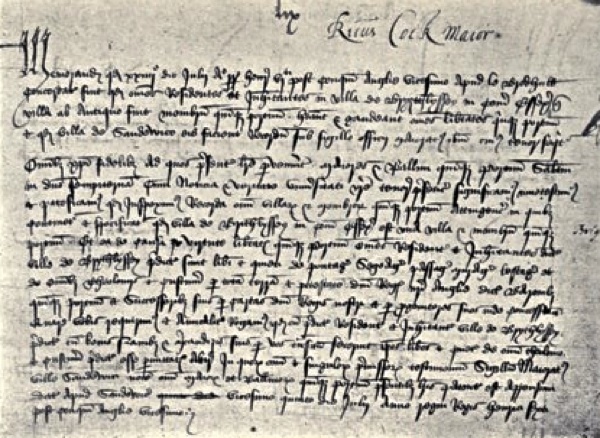 Charles Arthur Mathew came from modest Essex stock. His grandfather, Thomas Mathew, was a cordwainer making fine leather footwear and then later a tailor, while his maternal grandfather, Charles Wadley, was an agricultural labourer. 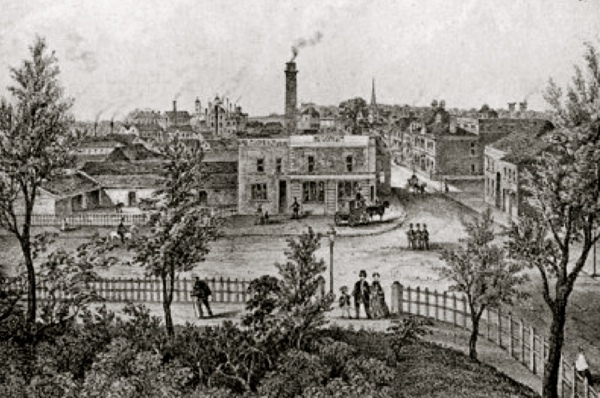 The census records tell us that his father, Charles Thomas Mathew, was a shoemaker then a letter carrier and later a surveyor ‘own means,’ while his mother Harriet had a brother who was a gamekeeper. The women in Charles’ extended family were generally domestic servants before they married, while the uncles and cousins worked as jobbing gardeners in the fields or in the fruit and vegetable trade as packers, porters and salesmen. His parents married in 1863 and Charles was born the following year. Three sisters followed but they were not close in age – Charles was seven when Ada was born, twelve when Frances came along, and twenty by the time Winifred arrived. They lived in Romford, then a small market town with close-knit streets of terraced houses near the High St and Market, and, upon finishing school, Charles was recorded at sixteen years old working there as a bookbinder’s assistant. In 1885, tragedy struck when his sister Ada died at just fourteen years old and his grandfather Charles passed away in the same year. Charles would have felt Ada’s loss keenly, surrounded by a family in grief. 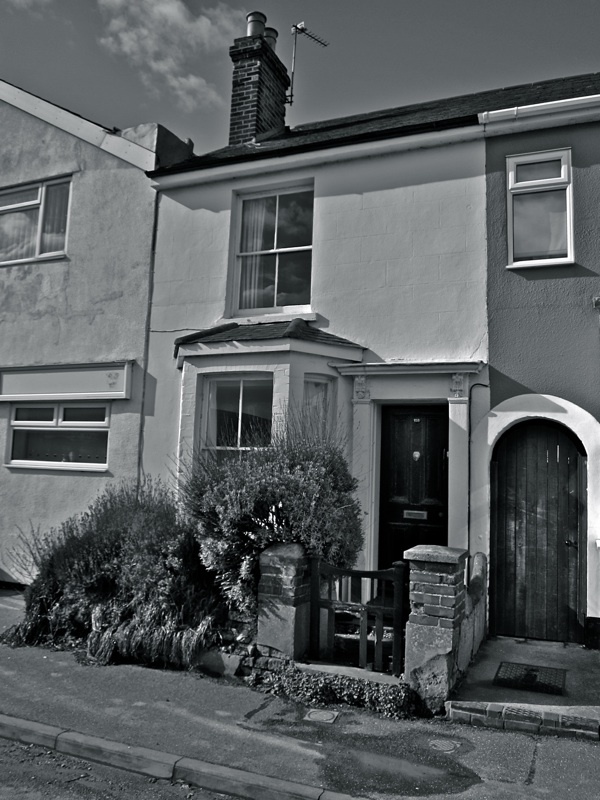 They moved out of Romford – perhaps to make a fresh start after Ada’s death – to Maude Cottage, one of a row of labourers’ cottages in the village of Stanway just outside Colchester. 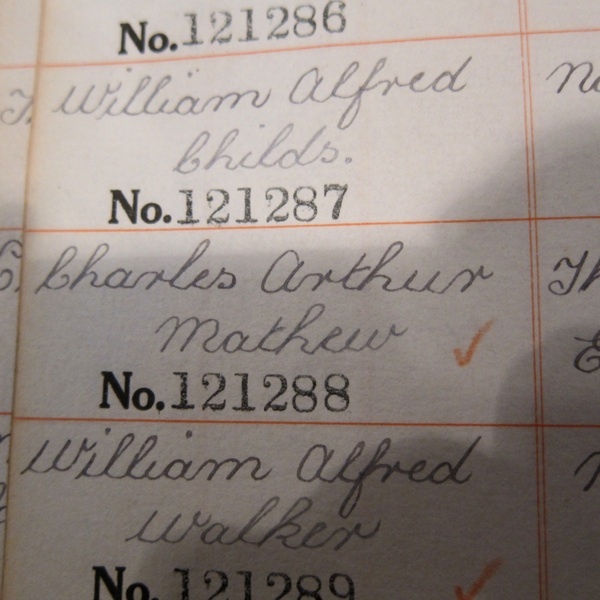 Yet there was another source of distress – at twenty-six years old, we find Charles recorded as an ‘invalid’ in the 1891 census. His incapacity is unspecified, but it was a further burden for the family. Yet by the spring of 1896, Charles’ fortunes must had improved because he married Ellen Mann, a school teacher from Southampton. They moved to Walthamstow, where in 1901 he was working as Clerk to the District Surveyor. It was in 1910 he made the bold decision that was to define the direction of his life and for which we remember him. Charles Arthur Mathew was in his forties, married but with no children, when he changed career and became a self-employed photographer. 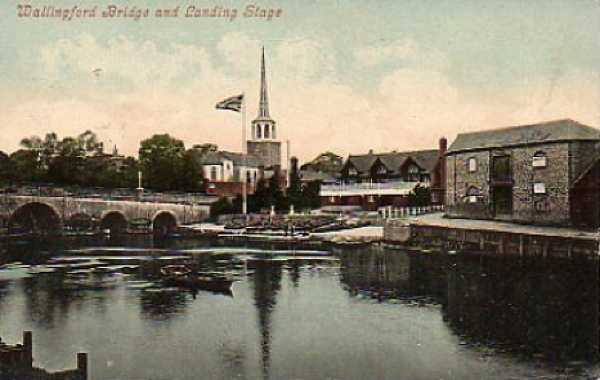 By 1911, he and Ellen were living and working at Brightlingsea, in Tower St near the harbour. One Saturday, 20th April 1912, when newspaper headlines were still carrying the news of the Titanic disaster, C A Mathew came to Spitalfields and took the photographs which would bring him fame, a hundred years later. 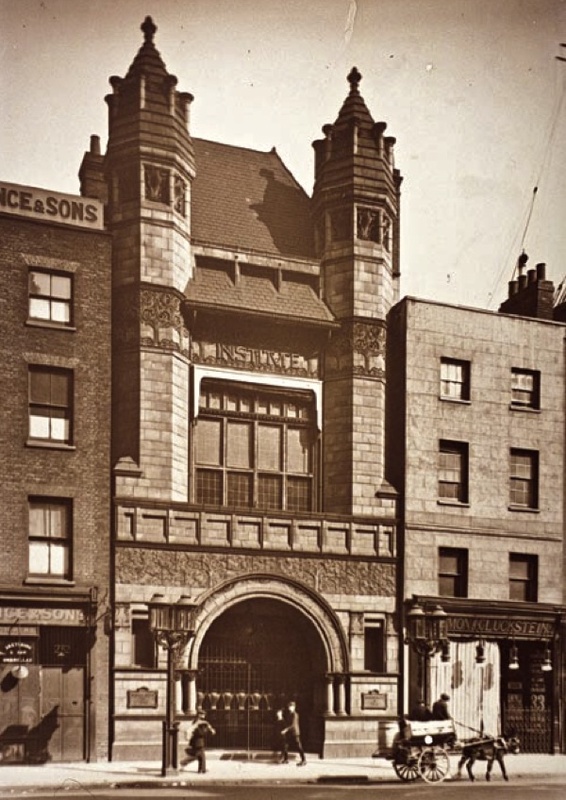 It was Charles Goss, the first Archivist and Librarian of the Bishopsgate Institute from 1897 until 1941, who acquired the photographs. 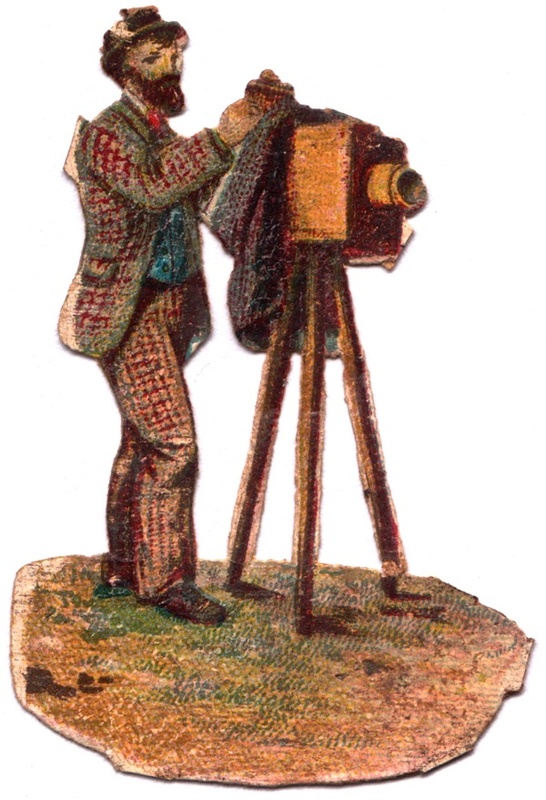 He was a passionate collector of all written, printed and photographic works recording life in London. Only two other photographs by C A Mathew are known to exist. 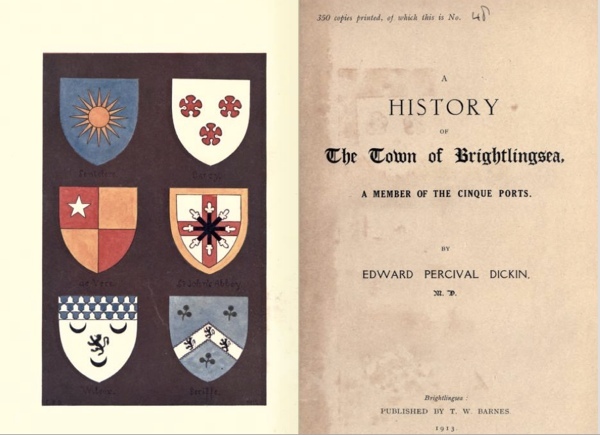 In 1913, ‘A History of the Town of Brightlingsea, a member of the Cinque Ports’ by Edward Percival Dickin listed Charles as a contributor. 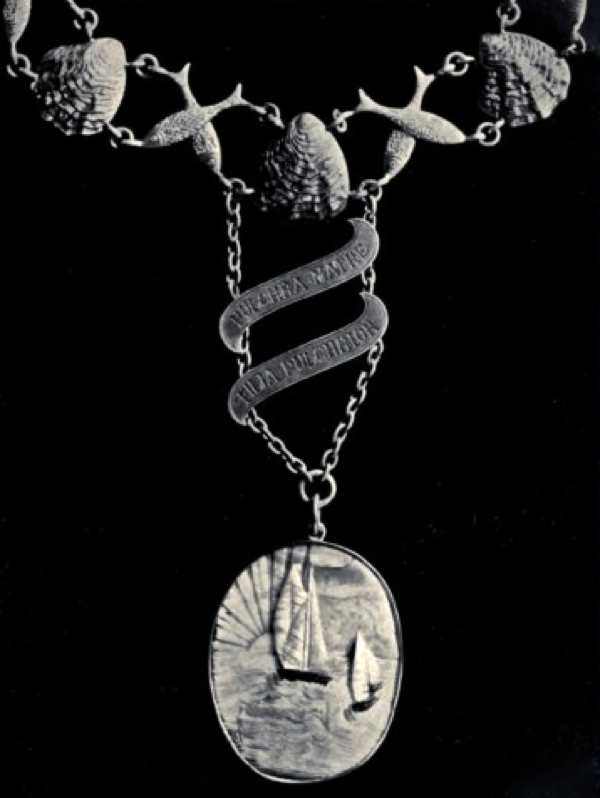 Both technical photographs, one picture is of a document of 1442 while the other is the Town Deputy’s badge and chain of office. In 1916, before there was any sign of an end to World War I, Charles’ wife Ellen died and for the first time he was alone. He left his Tower St studio in 1917 and after the War he was living with his mother and sister Winifred in Wood Green, staying there for six years before moving briefly to Bridge Studio, Wallingford, and re-establishing himself in a photography studio. 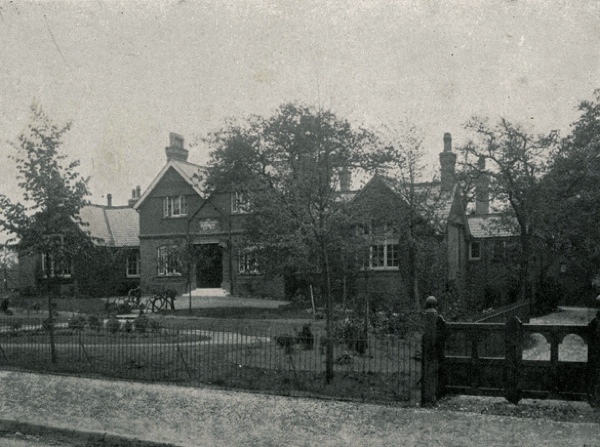 But it was not to last – by the following June, he was back near his mother and sister as a patient in the Passmore Edwards Hospital, Wood Green, only a short walk from their Woodland Rd home. It was here that he died on 9th June 1923, aged just fifty-eight, leaving his estate of £103 19s 5d to Winifred. After their mother’s death in 1928, Winifred vanishes from the records. She inherited his photographs along with plates, negatives, cameras and equipment, and what she did with them we do not know. Neither Charles nor his siblings had children, so his branch of the family ended and he was forgotten. I realised that the Great Northern London Cemetery near Wood Green is the most likely place where he would be buried, so one bright cold day this January I set out from Liverpool St Station to investigate. The office staff at the cemetery were helpful, taking the details and searching their archives. 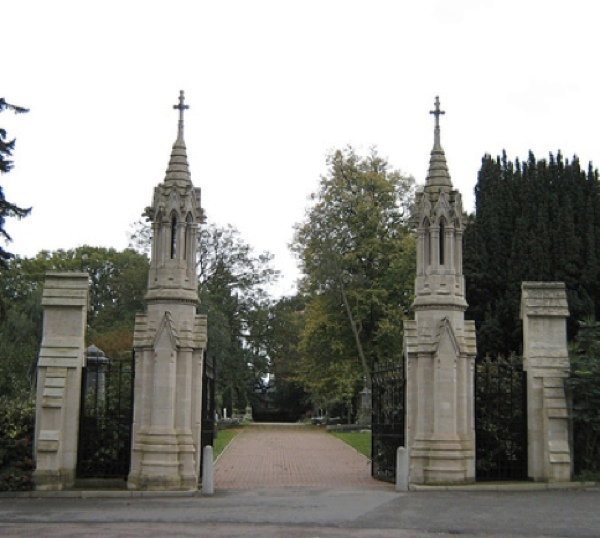 They found the burial book and in it – to my delight – was the name, Charles Arthur Mathew, buried 13th June 1923, together with a plot number and a letter from Winifred communicating that the plot was for two. I might have spent hours searching for the grave where he and his mother were buried, if the assistant had not come to my rescue. “It’s very muddy down there and extremely overgrown,” she said, “come with me on the buggy and I’ll get the site map.” We were off, passing the expensively manicured graves beside the centrally-located office. “The richer you were, the nearer to the centre you were buried,” she called to me at the rear of the buggy. We drew up near the perimeter railings and began searching for ‘MATHEW.’ The grave was unmarked but the map was quite clear and we soon found the spot. I was left alone with my thoughts. So close to the man, yet I could do no more than ponder his life and the unanswered questions it raised. 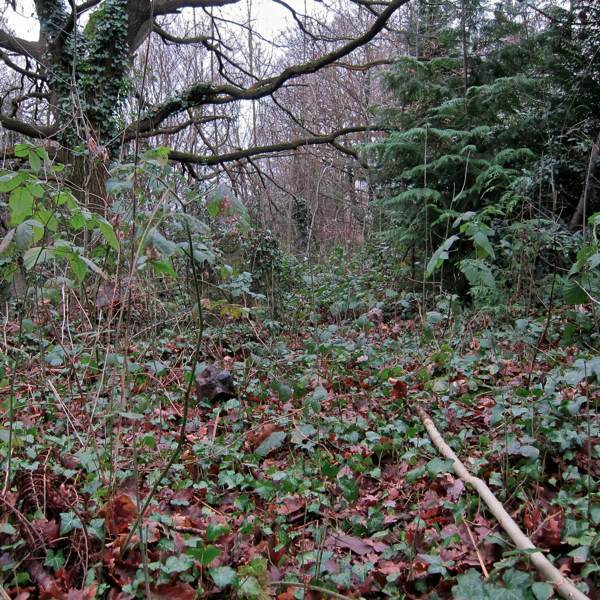 There was no marker only thick, tangled ivy and bramble and wild woodland trees. I found I liked it that way – beautiful in its anonymous, neglected state. I felt as if I were standing close to a distant relative or long lost friend and I was reluctant to leave. As I wound my way out through the thicket, I searched for means to acknowledge my visit. At the side of the track, away from the graves, rolled a small plastic pot and nearby a heap with discarded yet sprouting daffodil bulbs. 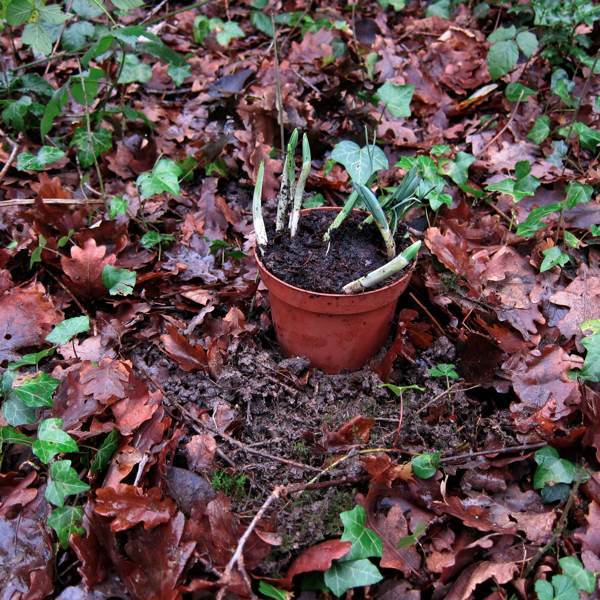 I scooped up some compost, planted the bulbs and took them back to where they are now, at the head of his grave awaiting the Spring. thank you for rescuing him. i love the daffodils. A beautiful post to accompany the evocative photographs C A Mathew left us. Many thanks. How extraordinary that the life of C A Mathew, with its successes and tragedies, could so easily have disappeared without trace and yet has beee revealed to us through a chance acquisition of his pictures and your historical research. Bravo! Very interesting research — thanks for it! Love & Peace and NO WAR in the Ukraine!! Ah, thank you, Vicky. Nice one. I particularly liked the description of your cemetery visit. A rewarding outing, the final para of which paints an especially poignant picture (for me). I also found the cemetery visit to be very touching. One naively believes that, being buried in a cemetery plot, that the marker would be there forever. But no – now he is just buried in midst of a little forest. That is quite lovely unto itself, however. This is a sad story evocatively told and illustrated by Vicky. I was born in Romford and grew up in Brightlingsea (many years ago) so it was doubly fascinating to see and read this story. Thank you.